« Best Walks of Geelong: It’s here!!! Indie the Kayak Dog – Expeditioner, Co-Author! Have just spent the past week getting out and about with the Geelong Walks book – so exciting when all your work comes to fruition and people start to use it! Now, though, my plate is clear so I can knuckle down on Melbourne for Dogs, which is due to the publishers at the end of April. From that point, it is still around 5 months of editing, designing, cartography etc until it reaches the shelves – I find the whole ‘hidden’ processes behind books quite fascinating. Meanwhile, my co-author on Melbourne for Dogs, a.k.a. 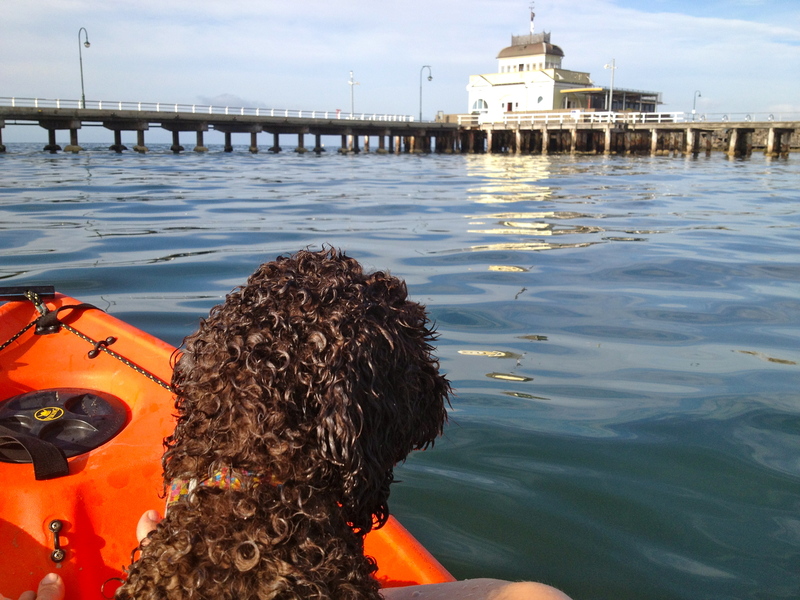 Indie, is just kicking back and contemplating the seagulls from her window seat on the front of my kayak, down at St Kilda marina yesterday – a great way to cool off after the longest lasting run of 30C+ February days we’ve ever had in Melbourne. Needless to say, we’re enjoying doing the beaches chapter of the book just now. West St Kilda Beach is a favourite – close by and off-leash for dogs all year round – plus the kite boarders who favour it provide endless hours of entertainment for dogs who run after their enormous, colourful kites in the shallow waters. Dog heaven. PS Doug – do let me know the shops you have been to which are not yet stocking it, so I can follow up. WE haven’t made it to Geelong’s south and west as yet. J.
Hi Doug – you’ll find my book currently available at: Geelong Library, the Geelong Heritage Centre, The Wool Museum Shop/Heritage Centre, Newcombe and Corio Newsagencies, Dymocks, the RACV Shop, Murphy’s Newsagency in Pakington Street, and Newcombe Central Lotto and News. Let me know if you have any trouble finding it. Kind regards, Julie.